Anti-piracy legislation has more than just Americans up in arms. Europeans are showing their distaste for such government intrusion, too. Tens of thousands of Europeans rallied this weekend to protest ACTA, an anti-piracy treaty many fear will impede freedom on the Internet. Similar concerns have been voiced about the recently tabled and much-maligned SOPA and PIPA bills in the U.S.
At issue: The downloading of copyrighted content that hasn't been paid for has been a widespread practice since peer-to-peer file sharing appeared around a decade ago, and well-funded organizations such as the Motion Picture Association of America and Recording Industry Association of America want it stopped. But are the strong-arm tactics necessary? Some studies show piracy is actually decreasing. According to a recent report issued by the International Federation of the Phonographic Industry, the global version of the U.S.-based RIAA, the number of consumers using paid subscription services rose 65 percent to 13.4 million during 2011, while the percentage of U.S. Internet users on P2P file-sharing services dropped to 9 percent in 2010 from 16 percent in 2007 and revenue from digital music sales rose 8 percent worldwide. And interestingly, one recent study has found that the biggest factor that affects the amount of illegal films being downloaded outside the U.S. is actually the fault of the content creators themselves. If they found a way to reduce or eliminate the lag foreigners experience when a film is released, less piracy would occur. Proponents of the Anti-Counterfeiting Trade Agreement say it will not change current laws but will protect content creators from increasing levels of online piracy. The agreement, which has been in the works for years, was signed last year by several influential countries, including the U.S. In January, the European Union and 22 of its member states also signed it, although it has yet to be ratified by the European Parliament. Now, because of strong public disdain for the agreement, several countries are holding off signing, including Poland, which was targeted last month by the hacker collective Anonymous, which has been vociferous about its contempt for ACTA. Among the protests Saturday: Thousands of citizens marched in Bulgaria. 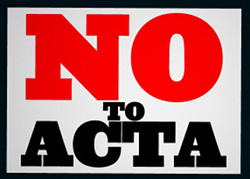 ACTA critics claim the treaty goes far beyond SOPA and PIPA legislation that was put on hold in the U.S. because of public backlash. They say it was crafted in secret and its supporters have tried to slip the agreement past the public without proper inspection. Opponents also take issue with text in the treaty that would allow countries to employ a three-strike rule that would require Internet users to be cut off if they continue to download copyright material after receiving two warnings. Regardless of what happens with ACTA, Europeans should get credit for standing up for what they believe in.